When you want to fit into your favorite jeans, but your thoughts are stuck on brownies make a batch of No-Cook Brownie Bean Chia Bites! 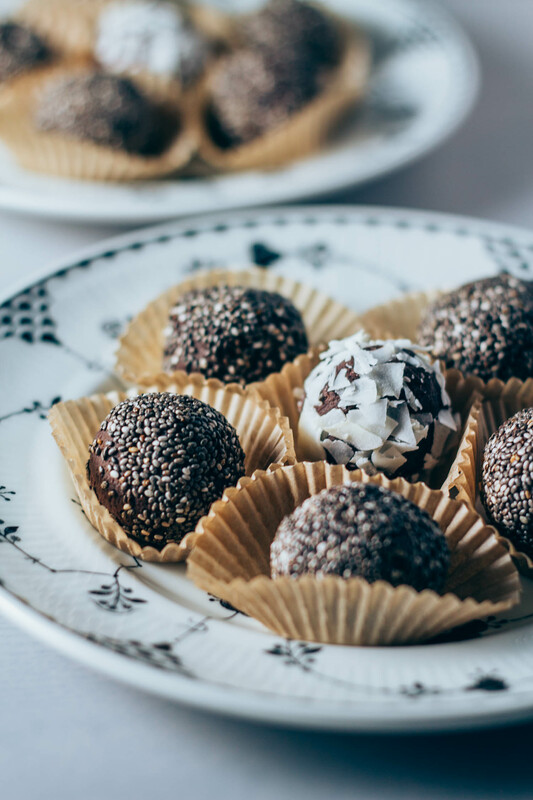 No-Cook Brownie Bean Chia Bites meet your chocolate cravings and provide beneficial protein. So, these chocolatey, creamy, delightful Brownie Bean Chia Bites are good for you! First, pour yourself a tall cold glass of plant-based milk. And then get ready to do a little happy dance! Because when you read the nutritional benefits of our tasty no-cook treat, you’re going to feel so happy you’ll want to clap along! With a super dark chocolate flavor and just a hint of cayenne at the finish, these bad boys scream grown up decadence. If I were making No-Cook Brownie Bean Chia Bites for little ones, like toddlers, I might leave out the cayenne, as divine as it is! With or without the cayenne (which I adore) our No-Cook Brownie Bean Chia Bites are genuinely healthy treats! You can feel one hundred percent good about sharing these goodies with the ones you love the most. And while you certainly can opt to substitute the raw cacao powder for cocoa powder, some health benefits will be sacrificed. For your reading pleasure, I’ll include a link to an article covering the many attributes of raw cacao powder in the notes following the recipe. I make a batch of No-Cook Brownie Bean Chia Bites and keep them in the fridge to enjoy whenever a chocolate craving hits. With tasty and nutritious treats like this around, I don’t even crave the bad stuff filled with fat and void of nutritional benefits. 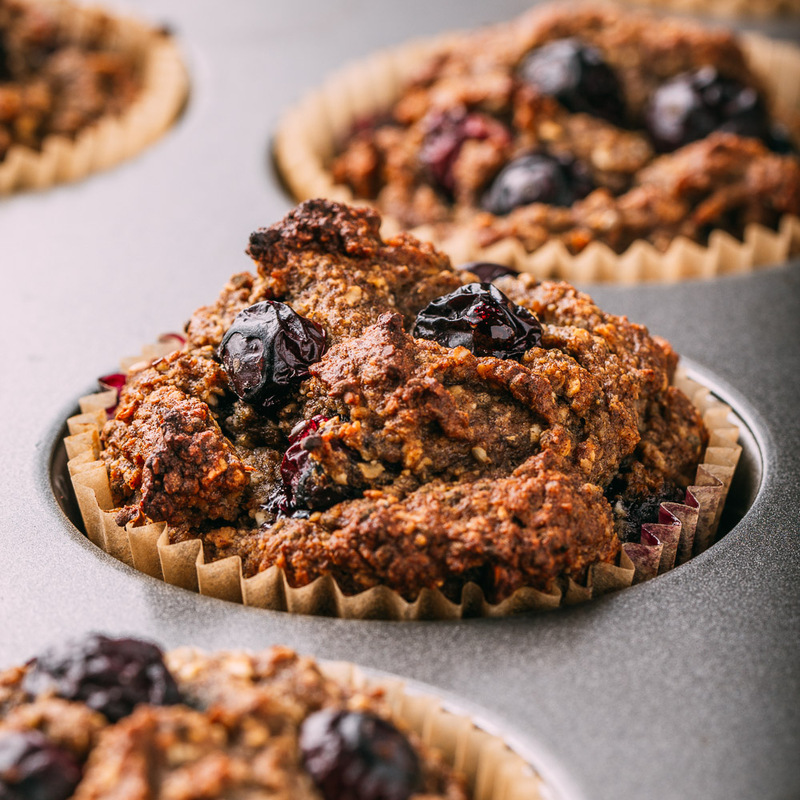 My favorite way to eat these is with a cup of strong black coffee mid-morning or with a smidge of red wine for dessert. 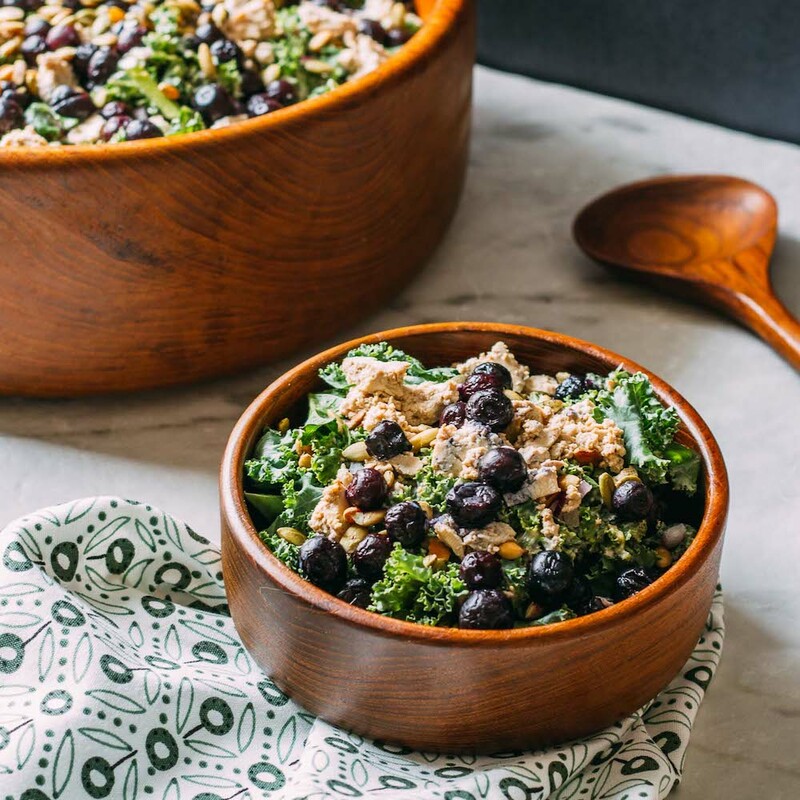 No-Cook Brownie Bean Chia Bites not only curb your craving for treats that are unhealthy; they provide you with valuable nutrients to help you feel your best! Who could ask anything more of a chocolatey, gooey, creamy bite of pure heaven? one or two pitted Medjool dates - Add more or less pitted dates based on the level of sweetness you prefer. 1 1/2 tbsp of coconut oil - To keep this refined oil-free, you can use one more date for stickiness or use 2 tbsp of milk from a chilled can of coconut milk. 1 1/2 tbsp of almond butter - Trader Joe's Crunchy Almond Butter works well! 1/8 tsp of cayenne pepper, optional, but for a bit of a kick... we love it! 1/2 tsp of cinnamon - This brand is our favorite organic cinnamon, so we buy it in bulk. First place the rinsed and thoroughly drained black beans, date(s), coconut oil (or coconut milk solidified portion), and almond butter in a food processor and process until smooth - just a minute or two. 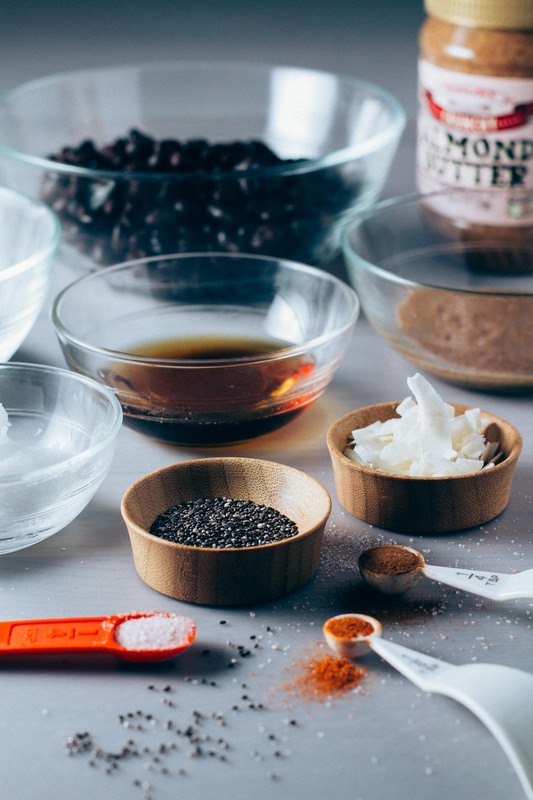 Next, scrape down the sides of the food processor and add the pure maple syrup, cacao powder, vanilla extract, cayenne pepper, cinnamon, and sea salt; process until the ingredients are combined. Transfer to a bowl and refrigerate for about an hour, or until firm. For the cacao, I opt to use 1/3 cup, but I like dark chocolate and dark black coffee... in other words, if you prefer a lighter chocolate taste, go with 1/4 cup fo cacao. 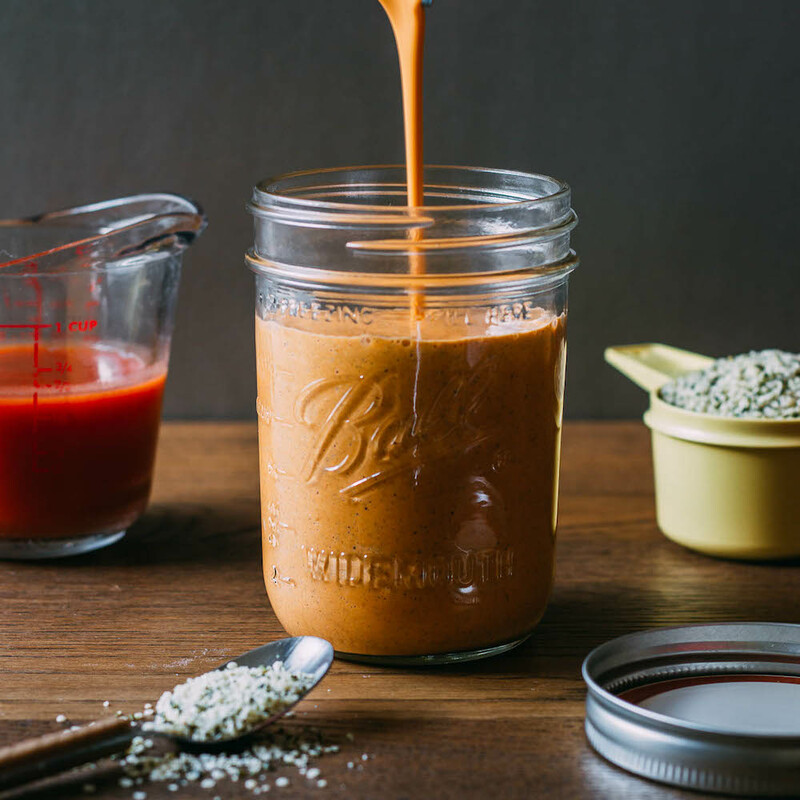 When the bean mixture has chilled to firm up, they're ready to coat in chia seeds. Pour the chia seeds into a shallow dish. Then, form the cacao mixture into bite-sized balls by quickly rolling between the palms of your hands. They'll be slightly sticky and will leave a delicious little brownie film on the surface of your hands. No worries there - that's a perfect consistency! 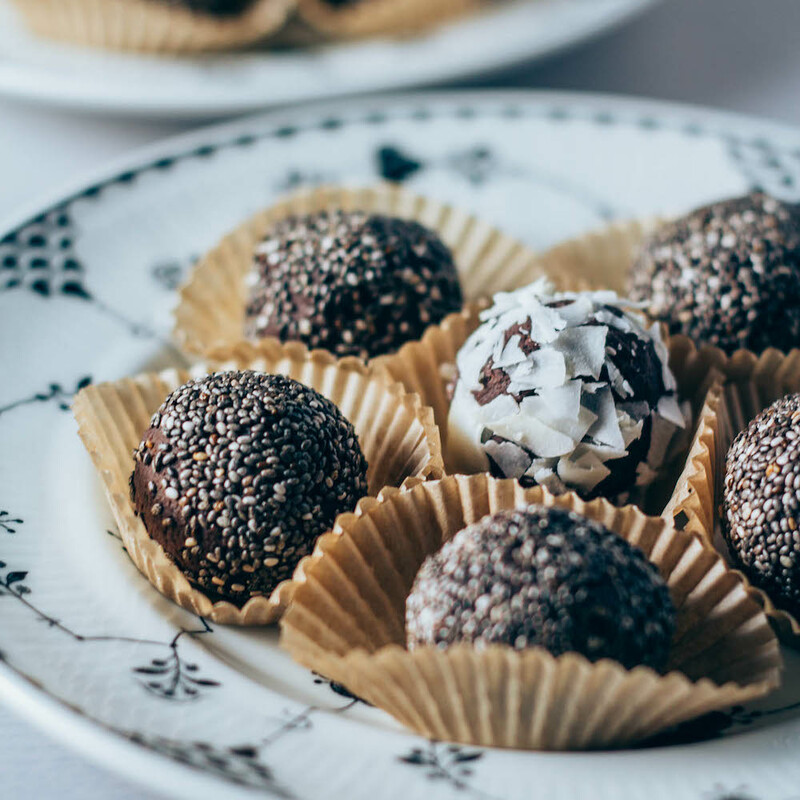 Next, place each cacao ball into the chia seeds while gently turning to coat evenly repeating the process until all of the bites have a chia coating in a single uniform layer. Last but not least, return your chia-covered No-Cook Brownie Bean Chia Bites to the refrigerator in a lidded container to allow time for them to regain a little firmness before serving. Fifteen minutes or so should be plenty of time. Enjoy eating your nutritious and delicious, chocolatey No-Cook Brownie Bean Chia Bites just as you would a traditional brownie. Our brownie bites taste terrific with a tall cold glass of your favorite plant-based milk. Brownie bites would be equally amazing alongside a dish of dairy-free ice cream and drizzled with a bit of pure chocolate syrup. Whenever I make something containing any chocolate, cocoa or cacao, I immediately think of my Mom who I know would have suggested using coconut. As it turns out, these treats taste fantastic rolled in deliciously chewy coconut flakes. 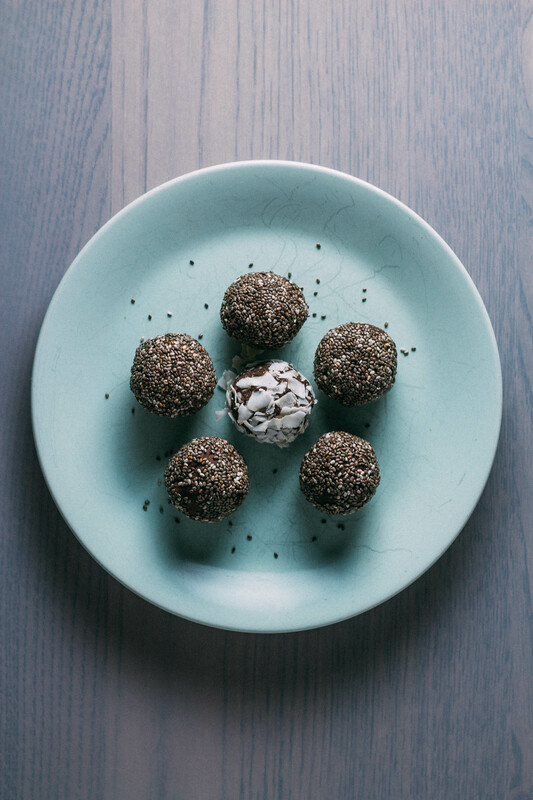 Covering these little brownie bites in coconut rather than chia is a terrific option... it tastes like you're eating a certain famous candy! If you would prefer your No-Cook Brownie Bean Chia Bites to taste a little more on the sweeter side, go ahead and add one additional pitted Medjool date while blending the ingredients in step one. I prefer only one Medjool date in my No-Cook Brownie Bean Chia Bites, but I also drink my coffee black so I like my chocolate dark! And as promised, here's a link to an article discussing the wellness benefits of glorious raw cacao powder!